While know as the Mercedes-Benz 300SLR the car was based neither on the famous 1954 300SL (W198) Gullwing road car, nor the earlier 1952 (W194) race car, although it bears a strong resemblance to both. Instead, it was based on the 1954-1955 Formula 1 Mercedes-Benz W196 race car. The name was in fact a product of the Mercedes' marketing department, who found 'W196S' an uninspiring name and instead ordered the name '300SLR'. It is generally accepted that this name references the car's lightweight construction as 'Sport Leicht Rennen'. The car used a space frame chassis using 25 mm diameter tubes of 1 mm thickness. This coupled with a magnesium-alloy (Elektron) bodywork giving it a dry weight of just 880kg. The car had a wheelbase of 93.3 inches and front and rear track measurements of 52.4 and 54.4 respectively. Ground clearance was 6.9 inches. Under the rear deck the car carried two spare wheels. The 2 1/2 8 cylinder in-line Grand Prix engine's capacity was increased to 2,981.70 cc (78.0 x 78.0 mm). This boosted output from 290 bhp at 8,500 rpm to about 310 horsepower at 7,400 rpm. The engine was longitudinally mounted and well back from the front axle was canted over at a 33-degree angle (4 degrees lower than the GP car) to lower its profile. This resulted in the distinctive bonnet bulge on the passenger side of the car. The engine was also unusual in that it used desmodromic valve actuation instead of springs. The car was fitted with very large inboard drum brakes which dwarfed the car's 16" wheels; the unusual shaft-linked brakes were originally to have been part of a planned four-wheel-drive system which was never developed. Having the brakes inboard would prove to be a problem with insufficient cooling causing them to overheat. The rear independent suspension used a low roll centre swing axle system, where a beam attached to each hub was mounted on the opposite side of the chassis. Thus, the beams were aligned slightly differently and crossed over in the centre line. Cornering forces did not jack the car up, as occurs with short swing axles. Competitors would comment that this proved a great advantage in the Mille Miglia as the Mercedes was able to more efficiently put power down on the uneven road than its larger competitors. The car's fuel itself was also odd - a high-octane fuel mixture of 65 percent low-lead gasoline and 35 percent benzene; in some races, alcohol was also used to further increase performance. As a rule, the car left the starting line with 44 gallons of fuel and more than nine gallons of oil on board, although Moss and Jenkinson began their assault on the 1955 Mille Miglia with as much as 70 gallons of Agip Supercortemaggiore gasoline which they proceeded to expend at a rate of 8.4 miles to the gallon. At Le Mans in 1955, the 300 SLRs were also equipped with "air brakes" similar in principle to those used on aircraft - this was a large hood that hinged up behind the occupants in order to slow down the cars at the end of the fast straights. Not having access to disc brakes the car's traditional drum brakes were inferior to the new disc brakes of its main rival Jaguar. Legend had it that the idea for this "wind brake" came from director of motorsports Alfred Neubauer, who was looking to develop a system to reduce the wear on the huge drum brakes and tires during long-distance races such as Le Mans and Reims. Neubauer foresaw wind resistance slow the car especially at Le Mans, as the French track's layout forced drivers to use the brakes hard and often to bring the car down from its maximum speed - around 180mph - to as little as 25mph. In tests the 7.5ft² light-alloy spoiler slowed the car dramatically and improved cornering stability. In addition to this in the cockpit were four buttons with arrows pointing to each of the four corners of the car, representing the brake drums. These buttons activated a device for unlocking a brake by squirting a small dose of lubricating oil on the offending drum. The SLR also had two seats, as required for sports racing cars of the day. In some racing events a co-driver, mechanic or navigator was given a ride. In the 300SLR's short career, this was only the Mille Miglia, as the 1955 Carrera Panamericana was cancelled due to the Le Mans accident. On short circuits as well as the Targa Florio passengers were not helpful, thus the passenger seat was covered and the passenger windshield removed to improve aerodynamics. In total nine W196S chassis were built. Wining the sports car championship in 1955 the Mercedes was not the fastest car, that honor probably belonged to 4.9-liter Ferrari but what it lacked in speed was more than compensated for by its durability as Peter Collins and John Fitch would attest to. "Despite Stirling's efforts and my own to write the machine off," Collins said after winning the Targa Florio, "by going over precipices and through walls and shunting other cars, still somehow the car managed to last right through the race." John Fitch had put his car to a similar test: "The durability of the SLR was unbelievable. As demonstrated here at the Targa, it would stand up to incredible abuse and continue to operate perfectly. This highly developed sports-racing machine was built like a tank, yet was as responsive as a jungle cat - a truly fabulous accomplishment in the field of automotive design." 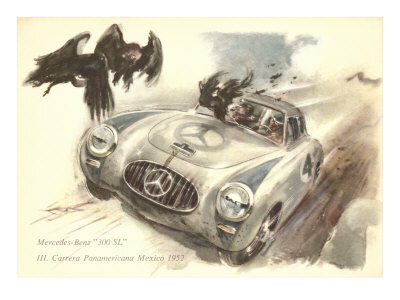 When Mercedes-Benz returned to motor racing in the 1950s it did so with an aggressive attack across the board. The magnificent 300SLR took Stirling Moss to a record-shattering victory in the Mille Miglia and (with Peter Collins) in the grueling Targa Florio. Other track victories took Mercedes-Benz to the World Manufacturers Championship that year. With unique and rarely seen images, Karl Ludvigsen presents the dramatic story of these racers with their tubular space frames, inboard brakes and fuel-injected desmodromic-valve, eight-cylinder engines. Covers the secret tests at Hockenheim, the never-raced coupe version of the 300SLR and the model prepared for 1956 - a season that these cars never experienced.